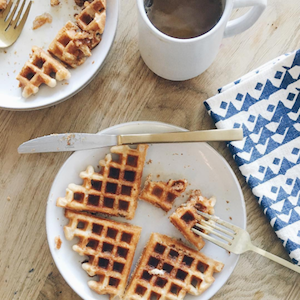 Contrary to what your friends’ photos suggest, Instagram isn’t just a social network for selfies and brunch pics. In fact, Instagram has a whopping 1 billion active monthly users as of June 2018 — the last 200 million of which joined in the prior nine months. In a time when visual content remains a crucial part of any business’ marketing strategy, Instagram marketing presents a unique opportunity to visually represent your brand, celebrate its personality, and keep it top-of-mind for all those users who scroll through their Instagram feeds every single day. Although they’re few and far between, there are some brands out there — in every industry, and with every type of target customer — who are doing really, really well on Instagram. These industries include skincare, lifestyle, education, shoes, interior design, entertainment, and even office supplies (one of the most B2B markets you can think of). Ready to get inspired? 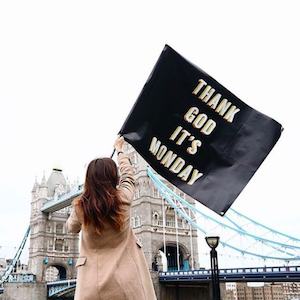 Check out this list of brands that are thriving on Instagram right now, and what about their posts sets them apart. For each of these brands, we’ve included examples of their best posts. For some of them, we’ve also included their most popular Instagram post of all time in terms of engagement (i.e. combined total of likes and comments) thanks to data from Instagram analytics and management platform Iconosquare. If you’re not following Lego on Instagram, you’re missing out on some entertaining content that isn’t just product plugs for kids. 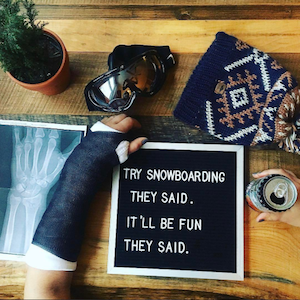 The famous plastic building block brand populates its Instagram feed with fun takes on pop culture references everyone is bound to appreciate — something many businesses can learn from on their own Instagram accounts. While most of Lego’s posts do serve to announce the release of new Lego characters, the main value in its Instagram account is to emulate familiar social tropes in a classic Lego way. Some of them are pretty impressive, like the life-sized flying car from Harry Potter and the Chamber of Secrets. Califia Farms natural beverage products have some of the most attractive packaging we’ve come across. In fact, it’s so iconic that it won top honors in the global packaging design category from Beverage World Magazine. 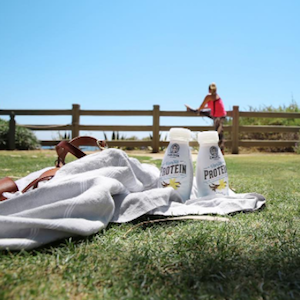 Instagram is a perfect platform to showcase that cool, curvy bottle, and the folks at Califia don’t shy away from doing just that — most of the brand’s posts feature the beverage’s containers in some way, whether they’re the main subject of the photo, or more of an accessory in the context of the active, healthy lifestyle Califia’s buyer personas love. Ever seen those photos of a woman leading a man by the hand in all different parts of the world? 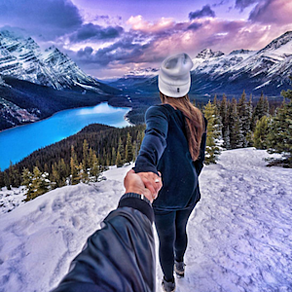 That pose was made famous by a couple named Murad and Natalia Osmann for their #FollowMeTo project. 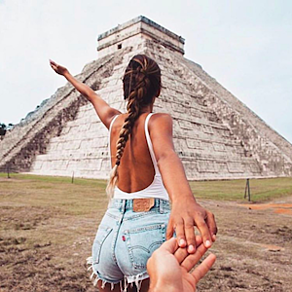 Their Instagram account is a mix of stunning images of the classic #FollowMeTo pose that have been edited beautifully, as well as some really interesting behind-the-scenes photos of their world travels — including some fun photos of the “making of” the famous pose. If your brand were a person, how would you describe its personality? Australian activewear company Lorna Jane has done an awesome job answering this important branding question with its Instagram content. 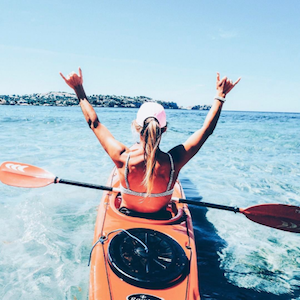 Spend just a few seconds scrolling through these photos, and you’ll quickly be able to name the target Lorna Jane buyer: a young, sporty, twenty- or thirty-something woman who values looking good while maintaining an active lifestyle. 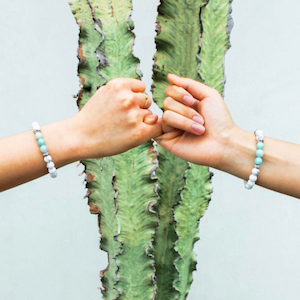 The images posted by Lorna Jane, which often show the brand’s clothing and accessories, as well as images of women who embody its target buyer persona, are colorful, playful, and inspirational, which is a perfect representation of the brand’s essence — in other words, its heart, soul, and spirit. 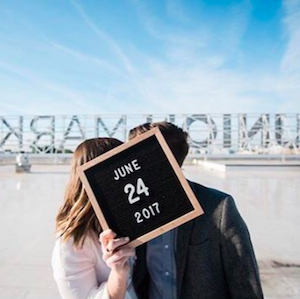 Letterfolk is a small business run by a husband-and-wife team who create and sell beautiful, handcrafted felt letterboards. 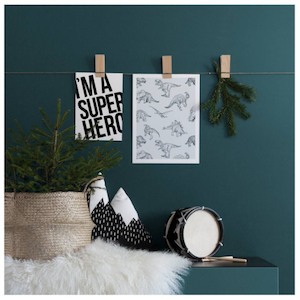 Each letterboard comes with a full set of characters so people can personalize the walls of their homes, which means endless room for creativity. Instagram is the perfect platform for them to inspire customers and aspiring customers with real customers’ boards, as well as ideas they’ve come up with and staged themselves. 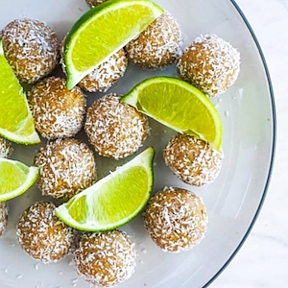 Their Instagram content is funny, thought-provoking, and relatable — all recipes for shareability. 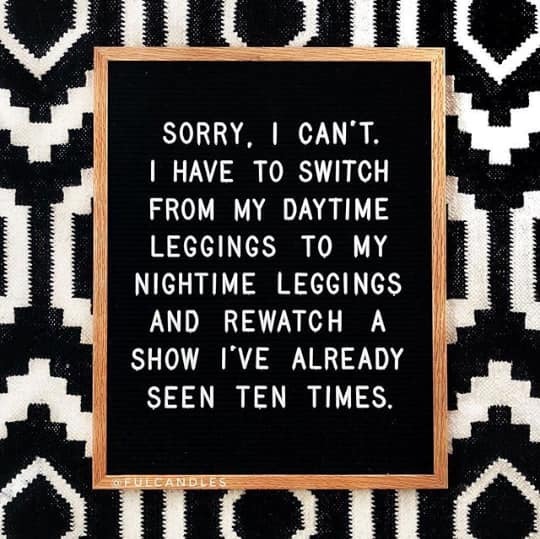 Why it’s engaging: Not only is this photo showing a funny and clever message, but it’s also very, very relatable to women — one of Letterfolk’s target customers. It’s also a very taggable photo, so the comment section is rife with Instagram users mentioning their friends’ usernames so they can share in the fun. 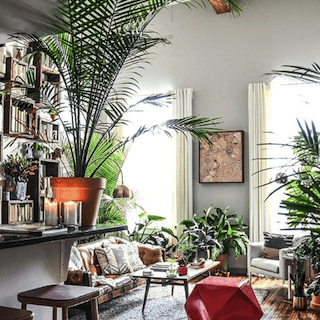 Apartment Therapy’s Instagram account really is a source of therapy, if you love the sight of cozy homes. 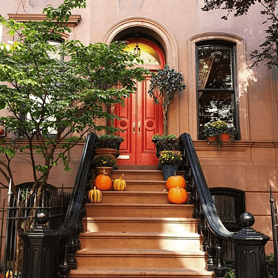 If you’ve seen social media posts from Apartment Therapy before, rest assured the pictures of residences on its Instagram account are just as creative. The city of Paris is known for many lovely things — wine, cheese, and art are just a few. 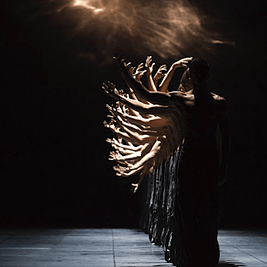 But that last one, art, is photographically captured on the Instagram account of the Paris Opera Ballet, or Ballet de l’Opera de Paris. 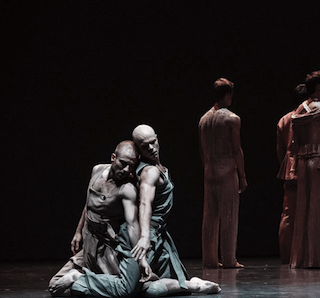 The account captures candid images of the ballet’s dancers during performances, rehearsals, and backstage, giving viewers an artful glimpse at what goes into the ballet’s productions. It also makes use of something called banners on Instagram, when larger photos can be divided into multiple pictures to create a tiled banner of smaller photos. (There are several apps available to pull that off, but to start, check out Tile Pic). The way this account highlights performance venues is noteworthy, too. 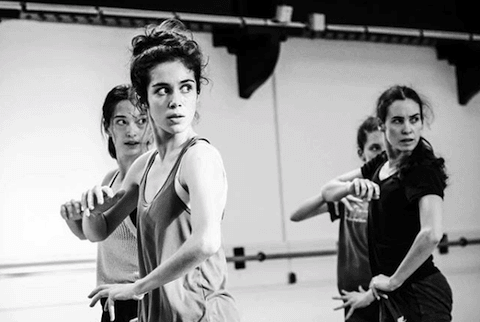 The third photo beneath the first two below provides an intimate shot of rehearsal, conveying a gritty behind-the-scenes feel that can generate excitement for productions. 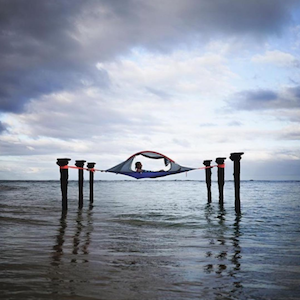 “Stunning” is the first word that comes to mind when I scroll through Tentsile’s Instagram photos. 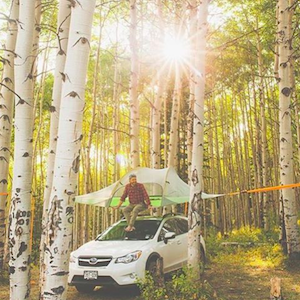 The company sells tree tents, what they call “portable treehouses” that will “literally take your camping experience to a new level.” Their Instagram is full of shockingly beautiful scenes of their product in use in all matter of terrain: rainforests, mountains, beaches… you name it. Why it’s engaging: Tentsile’s followers are interested in seeing the unique tent uses and setups that customers come up with. Not only is the post above a video — which are known for getting more engagement than photos — but the preview shot alone shows an intriguing location for a tree tent. For starters, how the heck did they get it up there? Look at the colors of any well-known brand and you’ll notice that they use the same colors over and over again — in their logo, on their website, and in their social media images. Using the same colors over and over again is a great way to establish brand consistency and help consumers become familiar with your brand. 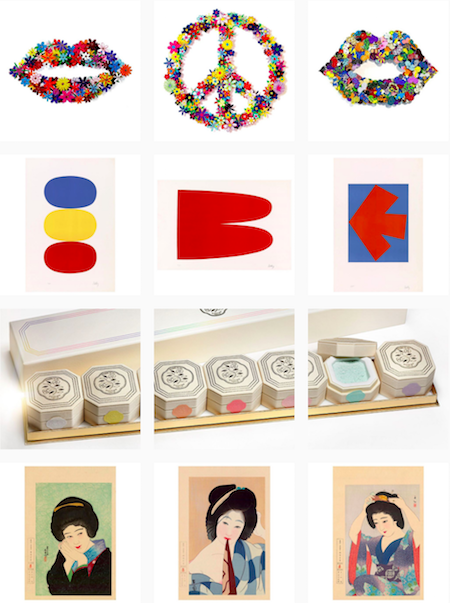 That’s what the Swedish online art print company Desenio does beautifully on their Instagram account. 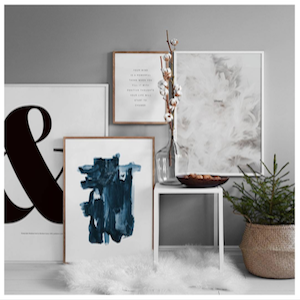 They use a lot of blues, greens, greys, and blacks, which evoke senses of calm, healing, luxury, and trust. Why it’s engaging: When your Instagram account is predicated on brand consistency, deviating from the usual theme or color might be off limits. But in minor doses, throwing something new into your feed can give your account a boost of engagement. The post above was a simple holiday card from Desenio, but it was so dramatically different from the look and feel of the business’s usual interior design, followers just had to click through to see more. Many of the comments included exclamations of how beautiful and evocative the post is. One commenter was inspired enough to describe what winters are like where they live. To increase your own comment rate, follow Desenio’s lead by posting images of things and situations that remind your followers of things they care about in their personal lives. The folks at No Your City produce a documentary series that captures the fascinating stories of people all over the world, but mostly in New York. The brand’s Instagram account, though, is less about these stories and more about showcasing gorgeous images from the city itself. What we love about these photos is how closely they follow the best practices for taking great photos with your phone. 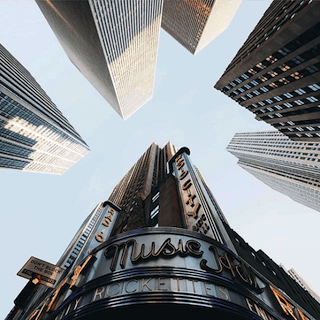 Each one of No Your City’s photos seems to follow at least one of these recommendations, whether it’s focusing on a single subject, embracing negative space, playing with reflections, or finding interesting perspectives. 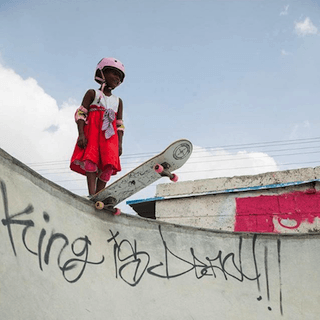 The photos are consistently stunning, and as a result, the brand has built a solid following. Vans is known for its stylish shoes, but the brand’s use of social media is just as stylish. Its Instagram business account is no exception. The maker of the classic checkered slip-ons has an aggressively flashy Instagram feed, featuring both standalone product shots and action photos of people expressing themselves in their favorite Vans gear. Why it’s engaging: Just because you’re promoting an ordinary product launch doesn’t mean the social media post supporting the launch should be equally ordinary. Vans’ recent video, above, endorses a line of shoes called ComfyCush, but the video itself is a little, well, weirder. And for a business so dependent on style, the right amount of weird can give Vans an awesome amount of engagement. Here’s an example of a small business performing very well on Instagram. A beaded bracelet could have any theme. 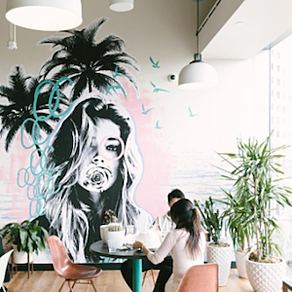 WeWork provides shared office spaces in cities and countries all over the globe — so it only makes sense that they should post a lot of photos showcasing their beautiful co-working communities. 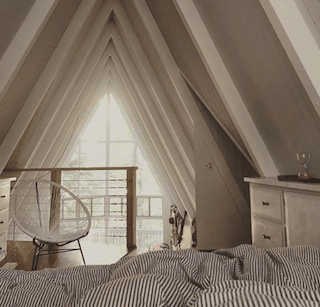 They do an amazing job photographing the spaces in ways that make followers like us wish we could jump into the photos and plop down with our laptops and a coffee. Our favorite is the #DogsOfWeWork hashtag. Not only is it awesome because, well, dogs … but it’s also a great way for the company to promote their laid-back culture while also inviting customers to interact with their brand on social. Near the end of each year, they actually choose the best photo submissions to the #DogsOfWeWork hashtag on Instagram and Facebook and put together a calendar for the following year. 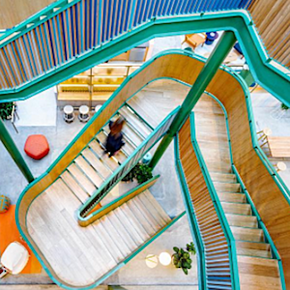 Why it’s engaging: For all its beautiful photos of people and office spaces and dogs, some of you might be surprised that one of this company’s most engaging Instagram posts of all time doesn’t take place in a WeWork office space at all. The video above is an example of influencer marketing done right. By partnering with actor and investor, Ashton Kutcher, the company caught the attention of its audience, and made it shareable by showing its followers a speech Ashton gave that resonates with WeWork’s followers. 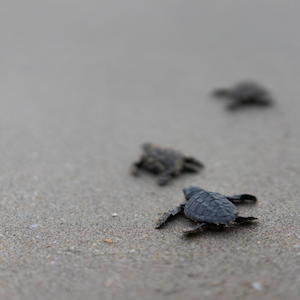 Use free design tools like Canva, PicMonkey, or even PowerPoint to create these images easily. 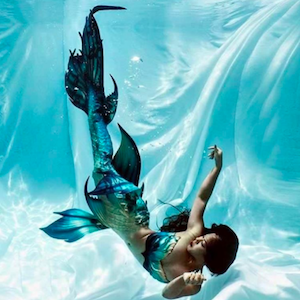 Ever wanted to be a mermaid? You can come pretty close, thanks to companies like FinFolk Productions. 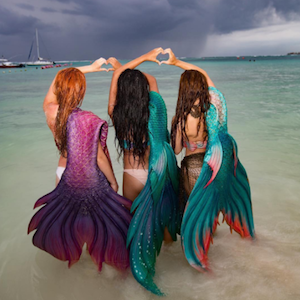 Believe it or not, silicone mermaid tails you can put on and swim around in are actually quite trendy in certain areas and for certain age groups — typically young girls, which is one of Instagram’s core users. Finfolk Productions’ Instagram feed is full of beautifully shot photos that play into the mermaid fantasy by looking more like mythical art than real people. Why it’s engaging: The post above is two things in one: a new product and a sentimental announcement by the company founder, Bryn Roberts. For most of Finfolk’s followers, the white mermaid fin above isn’t just a different color from the typical fins made by the company. It’s also emblematic of Bryn’s recent wedding, for which she wanted to make a bridal-style mermaid fin that all of Finfolk’s customers would appreciate. I never knew that planning a wedding would open up so much inspiration for me. While searching through many couture bridal gowns and other items, I began to envision how a truly couture bridal mermaid would appear. Apparently, all iridescent white with over 8,000 hand laid Swarovski crystals is the result I concluded upon. It is with great joy and some anticipation, that we release to you all, the Finfolk Swarovski Crystal Silicone Tail. Shiseido started out as Japan’s first Western-style pharmacy 140 years ago and has since developed into selling high-quality brightening and anti-aging skincare, makeup, and fragrance products. 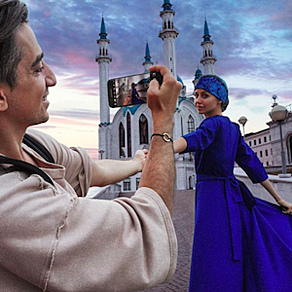 Its company mission is to inspire a life of beauty and culture — a mission they portray beautifully through their Instagram content. If you take a look at their feed, you’ll notice they post three images at a time so the posts appear in a row pattern on their larger feed — a very clever and original way to organize their content. Why it’s engaging: Back in late March 2016, Instagram started rolling out the ability to upload 60-second videos — and we’ve seen some amazing Instagram videos from brands ever since, like the one above from Shiseido. The one above lasts nearly all 60 seconds and its product demo is curiously satisfying to watch. The subject’s purple hair also gives followers a slightly edgier look to consider when browsing the company’s makeup collection. (Hot tip: Posts featuring faces, especially for a skincare brand, are ideal for boosting social media engagement). Don’t be intimidated by highly professional Instagram videos like theirs. You can post highly engaging videos on Instagram without a huge video team or a bottomless budget. Here’s a step-by-step guide for making great videos on Instagram without breaking the bank. Sephora Collections’ brand personality is playful, colorful, and feminine. It does a wonderful job of characterizing this personality in its Instagram content, using bright colors, patterns, and fun captions. This branded Sephora account also diversifies its feed with a lot of fun Instagram video content that gives off the same playful vibes. Why it’s engaging: Sometimes, you just have to cut right to the chase. Sephora made magnetic makeup brushes and wanted the world to see them. Businesses must be careful how much product-focused content they’re posting, but when you come up with something you know your customers will love, your best bet is to simply show it in action. 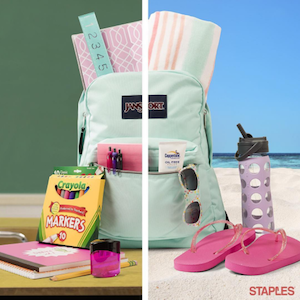 The folks at Staples do a lot of things right when it comes to Instagram content, but there are two that particularly grab our attention — engaging with followers by asking questions and including calls-to-action in captions, and staying true to the brand’s playful-yet-practical personality. When it comes to engaging Staples’ followers, it’s all about asking questions in the photo captions. 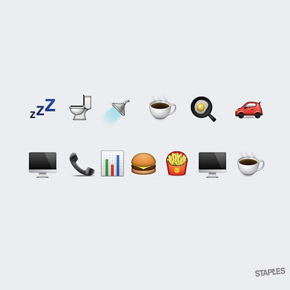 For example, check out the second photo below featuring a series of emojis — its caption reads, “That’s pretty much our day. How about yours? Tell us in emojis.” Scroll through the comments on that photo, and you’ll see followers had a lot of fun responses. The caption paired with the first photo below — the one with the cupcakes — asks users to tag someone who they want to thank. 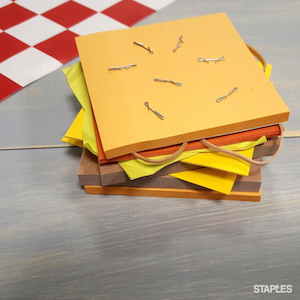 Staples does a great job staying true to brand by posting fun photos such as the “2016” shot written in office supplies and using the #OfficeHack hashtag to engage their following. Ready to populate your Instagram Story with pics and videos that are as captivating as the content above? We believe in you — just download the free branding guide below and get to posting.